The Nintendo DS will launch on November 21, 2004 for $149 in North America. Featuring two screens, wireless connectivity, and games that can be controlled by voice or touch, Nintendo DS breaks the mold of conventional handheld game systems. Powered by two processors, one ARM9e one ARM7, the Nintendo DS is capable of Nintendo 64 quality graphics. The system plays new Nintendo DS cartridges which can store more than 1Gb of data as well as existing Game Boy Advance cartridges. A lithium-ion battery enables 6 to 10 hours of play between charges. 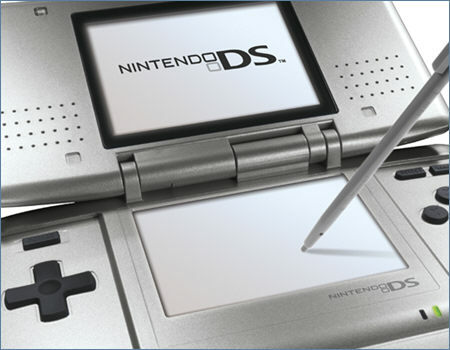 Nintendo's latest innovation, code-named Nintendo DS, provides users with a unique game-play experience using features never before offered by any other home console or hand-held game system. This portable personal entertainment and communications unit provides owners with new perspectives on dual screens, new control using both touch and voice, and new connections with two kinds of wireless game play. It's a newfound canvas on which developers can express their creativity. Dual Screens: Two LCD screens offer one of the most groundbreaking game-play advances ever developed: experiencing a game from two perspectives at once. Both screens are backlit, 3-inch, semitransparent reflective TFT color LCD with 256 x 192 pixel resolution and .24 mm dot pitch, capable of displaying 260,000 colors. Touch Screen: The lower screen will offer something never before provided by any game device: PDA-like touch capabilities. Players no longer have to rely on just buttons to move characters or shift perspectives. They can navigate menus or access inventory items simply by touching the screen with stylus or fingertip. The screen will have a tougher film cover for durability, and will come with a stylus. Microphone: An available microphone port means that in the future, players might need only to tell their games what to do. DS software could identify everything from voice commands to hand-clapping. Players might be able to move their characters simply by telling them which way to go. The voice capabilities also could allow gamers to chat with one another over the Internet while playing. Wireless: DS users will be able to connect with a local wireless network of up to 16 players. IEEE 802.11 and Nintendo’s proprietary format; wireless range is 30 to 100 feet, depending on circumstances; multiple users can play multiplayer games using just one DS Game Card. The DS technology also provides for a wireless LAN connection, which could allow a theoretically infinite number of players to connect at a hot spot and compete at a central game hub on the Internet, even if they're thousands of miles apart. Wireless Game Sharing: If software developers desire, multiple players can compete in wireless games, even if only one person has a game card inserted. Players could also test-play games for themselves as long as they stayed connected. 3-D: With the newly developed graphics engine, DS can reproduce impressive 3-D renderings that can surpass images displayed on the Nintendo 64. Games will run at 60 frames per second, and allow details like fog effects and cel shading. Sound: The 16-channel sound allows for greatly expanded use of voices and music, and a richer, more immersive game experience. A plug for headphones transmits stereo sound. Battery & Power Management: The battery is rechargeable and the unit features a low-energy-consumption design. The DS also has Power Management functions of Sleep mode and Standby mode. Processing: The unit will run on two processors, one ARM9 one ARM7. New Media: For its compact cards, the unit uses newly developed semiconductor memory, which allows for lower cost, shorter manufacturing time and memory capacity of more than one gigabit of information. Dual Slots: Nintendo DS makes a vast library of Game Boy Advance games readily available. Developers could find ways to make new connections between GBA games and DS games. The GBA port could be used for new hardware, enormously expanding the functional expandability of the DS. Other Features: Embedded PictoChat software that allows up to 16 users to chat at once, embedded real-time clock, date, time and alarm, touch-screen calibration.